What kind of chevron is on his right sleeve? I believe that is a "kreisfuhrer" administrative rank wreath and star. It denoted the wearer as leader of his small group or engine company. This was necessary as many volunteer firemen held the same actual rank. Like the officer of the deck badge of the navy this denoted who was the leader amongst a group of equals. With the angle it is difficult to tell what the insignia is. 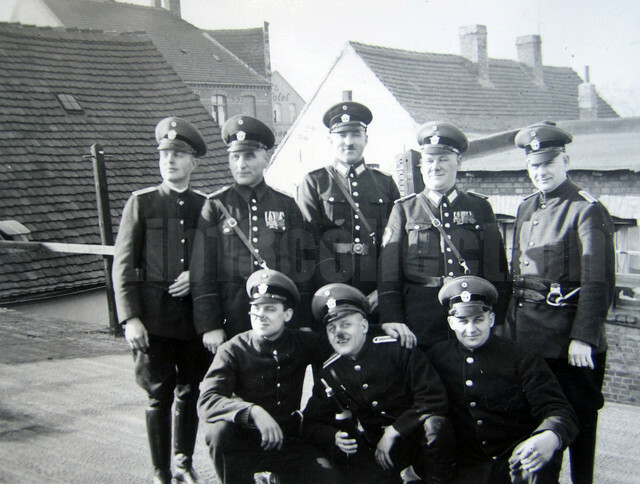 But much insignia of Freiwillige Feuerwehr units were carried through after nationalization of the forces until uniforms were standardized. These insignias from Bolko Hartmann's book on Feuerweht insignia and uniforms is an example. This is the insignia that I was thinking of....from Deuster. The wreath in the photo seems to be similar, not exact, but these volunteer insignia were made locally so anything goes. Deuster says that they appeared only in 1942. In the photo, it seems to me, an earlier period. But the form is similar, you are right. That photo could easily be post 1942. Volunteers even wore Imperial tunics through the end of the war. They didn't exactly adhere to the nuances of regulation. They also continued to use the 1934 cap eagles until the end. These guys weren't paid, so whatever was available they wore. It doesn't seem much different these days as I have seen war time looking helmets still in use in rural Bavaria. 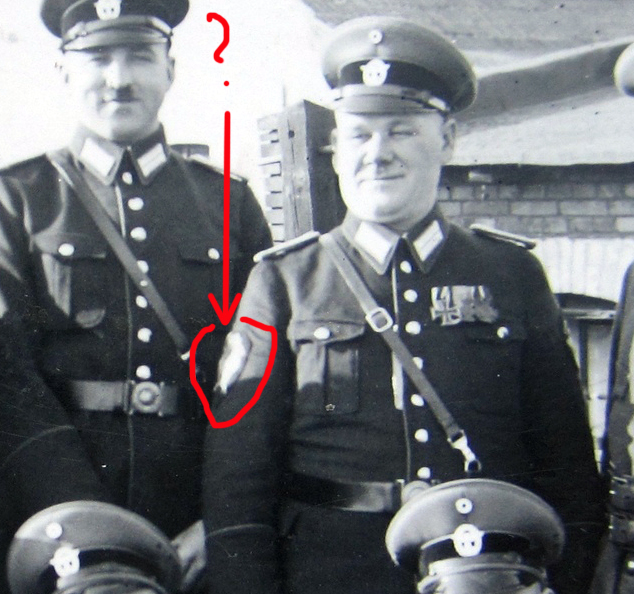 From its position and size, it is certainly not the Kreisführer/Unterkreisführer badge. That one was worn on the lower left sleeve and was only 6 centimeters (less than 2 1/2 in) tall.